In the mood for something light and tangy? 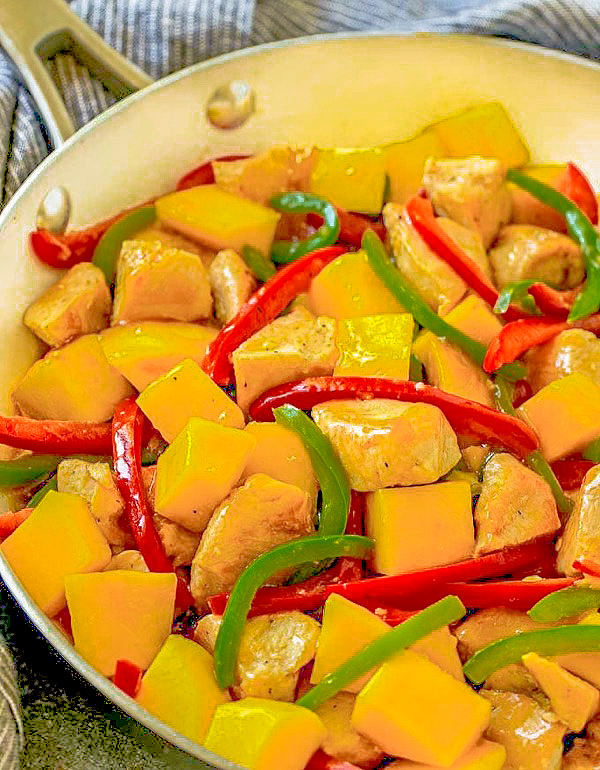 Mango with chicken is an unusual pairing, but the flavour combination really works! The end result is a tropical tasting meal that’s perfect served over rice. 1. Cut chicken into three 4 inch pieces. 2. Seed, core and cut peppers into 1-inch pieces. 3. Slice onions into 1 1/2-inch lengths. 4. Peel and pit mangoes and cut into 2/3-inch pieces. 5. Whisk together stock, sugar, soy sauce, vinegar, cornstarch and curry paste. 6. In wok or skillet heat half of the oil over high heat; stir fry chicken for 4 minutes or until no longer pink inside. 8. Add remaining oil to wok; stir-fry peppers for 2 minutes. 9. Stir in ginger, cook for 30 seconds. 10. Add stock mixture and chicken, cook stirring for 2 minutes or until sauce is thickened and chicken is hot. 11. Stir in onions and mango. 12. Sprinkle with cashews (if using). Serve with rice. Recipe: Mango Chicken 0 out of 5 based on 0 ratings. 0 user reviews.